Rituals is a popular Dutch cosmetics brand that helps consumers enjoy the little things in life and makes them feel good. To support this mission, three years ago they launched a meditation app which is designed to help people unwind and find a relaxed moment in their rushed lives. 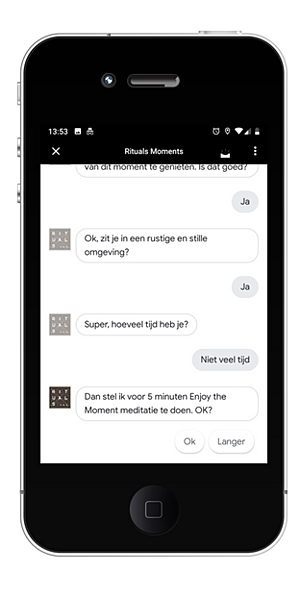 With the recent launch of the Dutch Google Assistant, Rituals decided to engage their Dutch speaking customer base in conversations with their app via Google. Users can now talk to Rituals Moments in a very natural way. Depending on their mood the Assistant may suggest a 5 or 10 min meditation session to help them feel better again. Select Add/Import project to create your agent. First, define your intents. These are the tasks that the agent will provide to the user (in case of retail it can be a query about support, a question about stock availability, etc.). 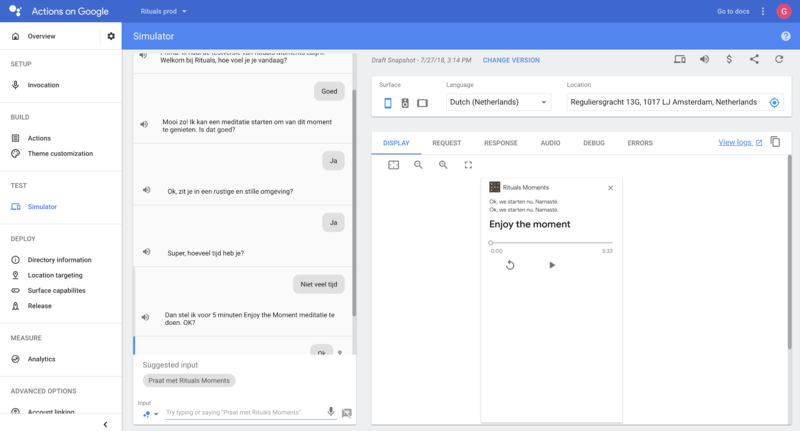 The intents' discussions can be defined using Actions on Google's SDK or using Dialogflow (an online user-friendly graphical interface that uses natural language processing to enable conversations with your app). When your agent is fully complete you can release it to alpha, beta and then release it to production. To build the first agent from scratch you can estimate around 2 days of work for a single developer. Not sure where to start? Contact us.